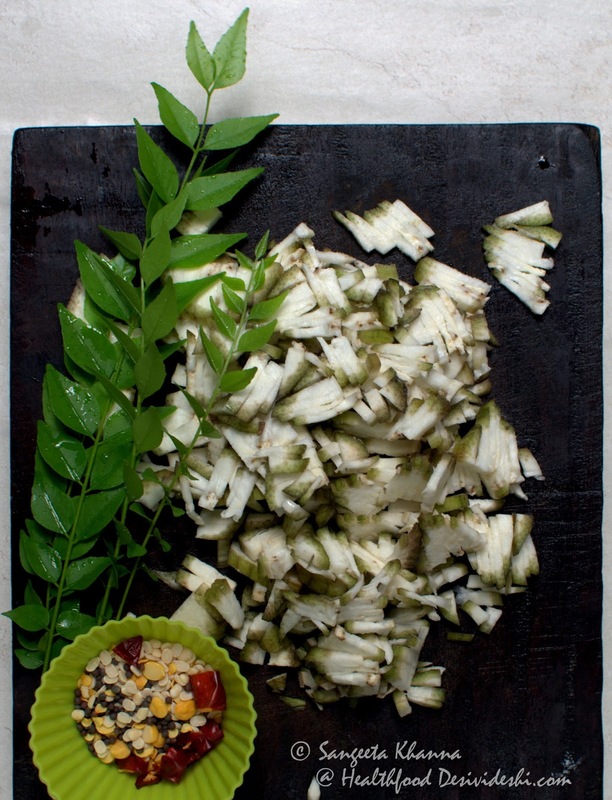 Raw plantain or kachha kela is one of my favourite ingredients and I always have a couple of them in my fridge. In fact I buy a big bunch if I see nice fresh raw plantain with unblemished skin in the market. I never discard the skin so always make it a point to get fresh skinned plantains. Kela meti ki subzi, kele aur sem ki subzi are favourite in winters and I make a chutney with raw banana peels sometimes. Kachhe kele ke kofte is made less frequently though. I make the kababs with them too but haven't managed to post the as yet. There are two types of raw plantains and no these are not the same variety that we eat as ripe bananas. Plantains taste very different even when they are ripe and I quite like the fritters made with them. In the picture below I have shared the two types we get. The rounded variety with a fat middle part and darker skin is the one that gets a little dry after cooking. The other slim plantains with lighter skin colour and slender tapering ends are tastier and stay soft even after cooking. There is a slight difference in taste too. 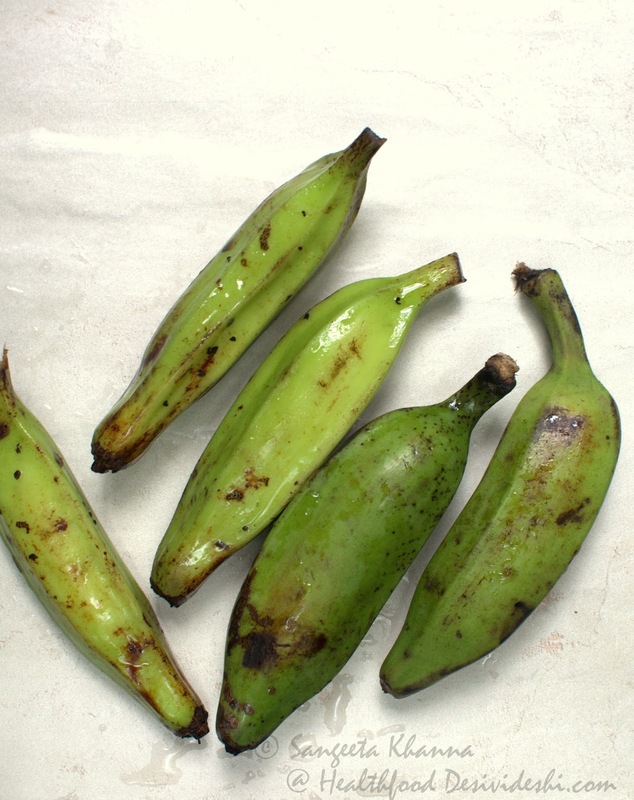 The stout plantains are suited more for kababs and koftas and the slender ones for stir fries. But if you get tender plantains then even the stout ones are good to make stir fried dishes. And that is what I did in this recipe. It so happened one day that I was alone at home and was thinking what to cook for my brunch. I saw Nandita had posted her plantain podimas recipe and I wanted to eat that. Podimas is normally cooked with boiled, peeled and grated plantains but since I wanted to retain the skin and wanted the stir fry to be quick too. After searching and reading a few recipes I came up with an altered recipe that suited me just fine. I actually loved the taste. The first thing you have to do is lightly peel the plantain skin with a potato peeler so only a very thin layer is removed. If using a farm fresh plantain I would skip this step. 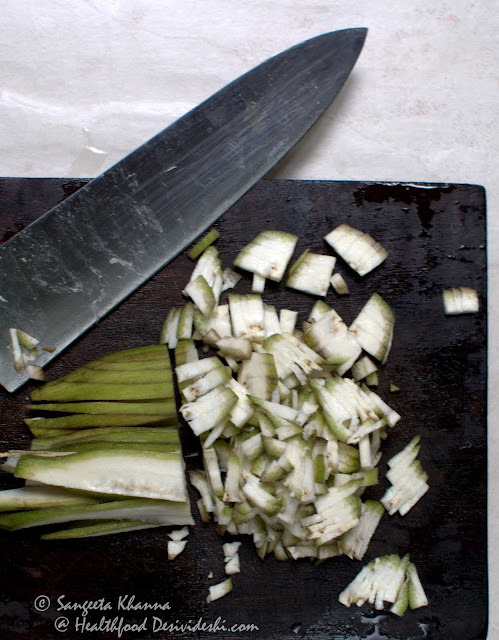 See how I cut the plantain in half lengthwise and then sliced thinly, before chopping small bits of it that resembles grated vegetable. You may want to grate using a box grater. Then heat the ghee, add hing, mustard seeds, lentils and red chili in that order and let them all become aromatic. Add chopped curry patta and fry for a second or two. Now add the chopped or grated plantain along with salt and stir fry for about 3-5 minutes or till it cooks. 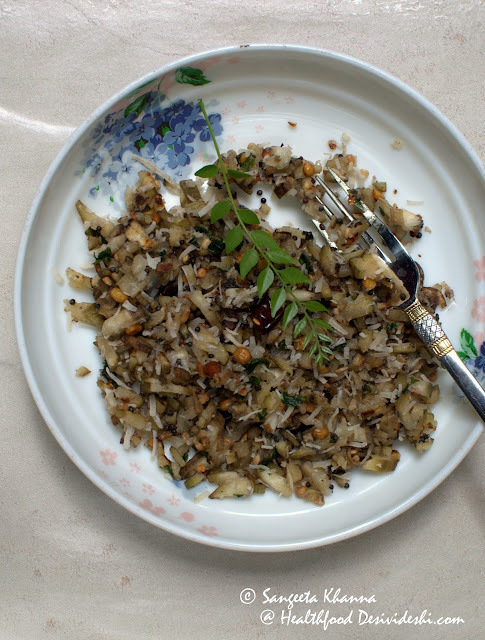 Add the grated coconut, lime juice to taste and mix well, cook for a minute and serve immediately. 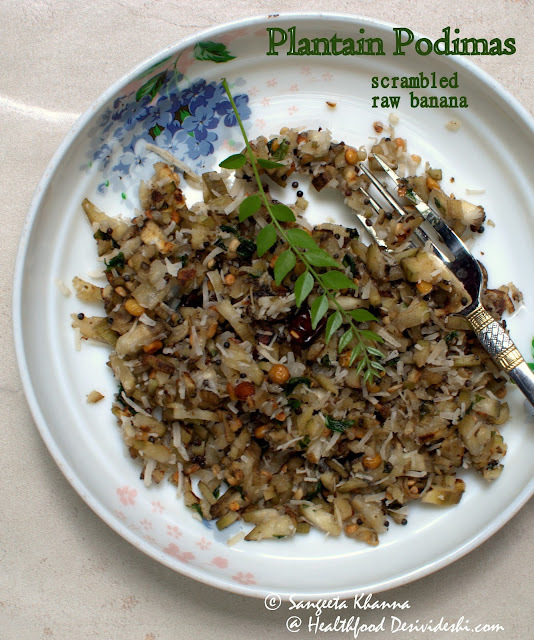 This plantain or raw banana podimas is a great substitute of poha or upma kind of breakfast. 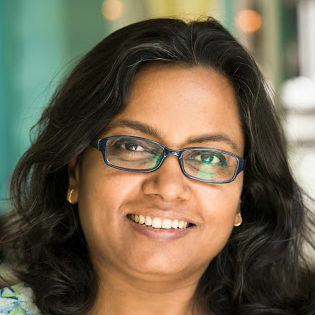 I had a glass of buttermilk with it and it was a very satisfying meal that kept me full for many hours. Did you know raw plantains have resistant starch that makes this vegetable a very low glycemic index and that it is prebiotic too? This breakfast is supplemented with good fats, great variety of fiber, complex carbs and yes even some protein. Add some sesame seeds if you want a little more protein in this meal. I must tell you raw banana podimas is served like a subzi or side dish with Indian meals of rice and sambar etc. Converting it to a breakfast dish may work for you too. And mind it, this is a 10 minute breakfast recipe. Great idea to make podimas a breakfast dish! As you say it is quick and easy.